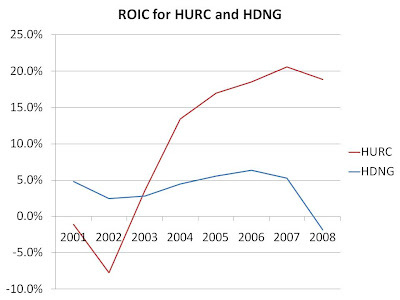 In the last several years, HURC has managed to generate solid returns while HDNG has struggled even during periods of relatively strong macroeconomic growth. Over the period displayed above, HDNG returned an average of 3.7% on its invested capital while HURC returned an average of 10.4%, meaning HURC was able to generate more income out of its assets. While HURC appears to be the better run company, which one is the better investment? "Buy best of breed companies" is the oft-repeated investing mantra that many investors blindly follow. But what this advice fails to take into consideration is the asking price: while HURC trades for its book value, HDNG trades at about a 60% discount to its book value. Therefore, if the businesses perform the same as they have in the past, buyers of HDNG will see similar returns on their investments as will buyers of HURC, thanks to the discount being offered on HDNG's book value. But what if returns are not the same? HDNG has recently taken on new management following its poor performance and is in the process of attempting to improve its cost structure. Should the company increase efficiencies such that returns on capital return to respectable levels, shareholders should see enormous price appreciation as the current discount is erased. But what if returns should fall? Fortunately, at this price, investors are protected by the company's cash, inventory and accounts receivable, which sum to a level higher than the current stock price, even after subtracting all liabilities. Neither company will likely see its sales levels grow for some time, as their customers continue to cut expenditures to boost their bottom lines. But from a business value standpoint, one company does appear to offer an enticing price to long-term investors, even though it has been a poor performer. But investors needn't bet on a turnaround, as the discount to book already offers investors the prospects of decent returns, while a margin of safety exists such that capital appears to be relatively safe. We have previously seen another example of this phenomenon as Office Depot traded at a massive discount while best-of-breed Staples maintained a fair price level. hi Barel, i follow your blog on a everyday basis from Argentina. I want to ask you, what do you think of the 24 mill impairment charge made in 2008 on goodwill and intangibles, is relevant to our analysis of more valuable assets? it is proper to include this impairment in our calculation of the earning power? What do you think of the fact that their inventory is the bulk of contributor to the disparity in book value vs. market value. I would say the inventory is worth what the market is marking it at due to the environment. Is your hope that the other more liquid assets will allow it to maintain survival until the value of the inventory returns? That's a bit of a judgment call. The possibility is there that the company will use shareholder capital to purchase companies that it will subsequently writedown, and so if you believe this, you should include it in your calculation of earnings power. On the other hand, it is a new CEO so one might express hope that capital will be better allocated. Researching the management might help you decide whether you should include it. While inventory is a large component of their assets, gross margins last quarter were still above 25%, and therefore I'm not in agreement that inventory is worth what the market is marking it at. Furthermore, inventory has come down by $30+ million (half of the company's market cap) in the last few quarters, and I would expect inventory to continue to be a source of cash and therefore actually aiding in maintaining the company's survival.